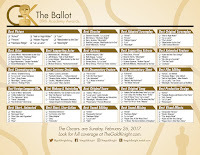 The Gold Knight has designed a one-page printable ballot for the 2017 Oscars. Download it now! The Gold Knight has designed a one-page printable ballot for the 89th Academy Awards. 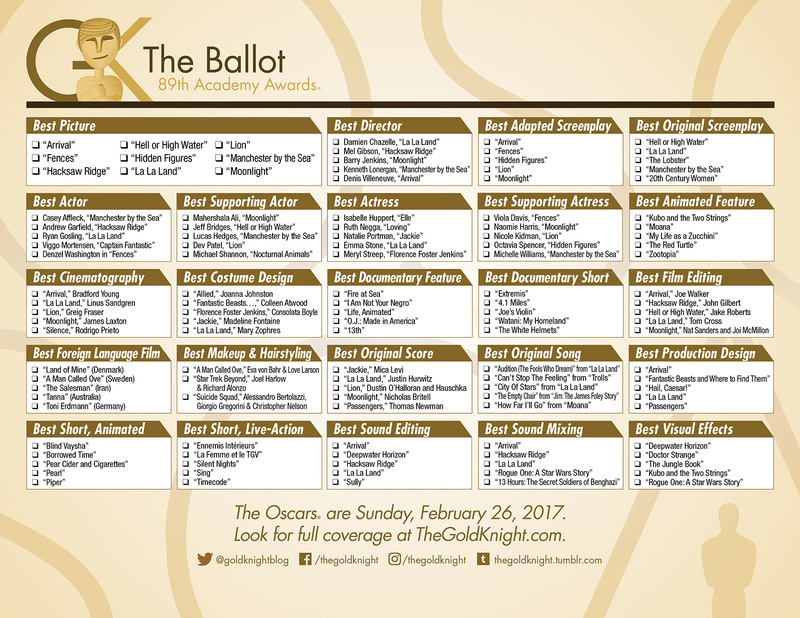 This gorgeous ballot is the perfect complement to your 2017 Oscar Party or office pool. Download the ballot, print it out and pass out at your workplace or during your party (go here to download the PDF). It's in glorious color. With 14 nominations, "La La Land" has tied the Oscar nominations record with "All About Eve" and "Titanic." Will the movie musical sweep the ceremony, matching or surpassing the Oscar record of 11 wins (by "Ben-Hur," "Titanic" and "The Lord of the Rings: The Return of the King")? While unlikely, it's possible. With two nominated songs, the most statuettes that "La La Land" could win is 13. "La La Land" also breaks other records. It's the first musical with original music and story to receive a Best Picture nomination since 1979's "All That Jazz" and 1945's "Anchors Aweigh." Ai-Ling Lee and Mildred Iatrou Morgan are the first female team to be nominated for Sound Editing for the film. 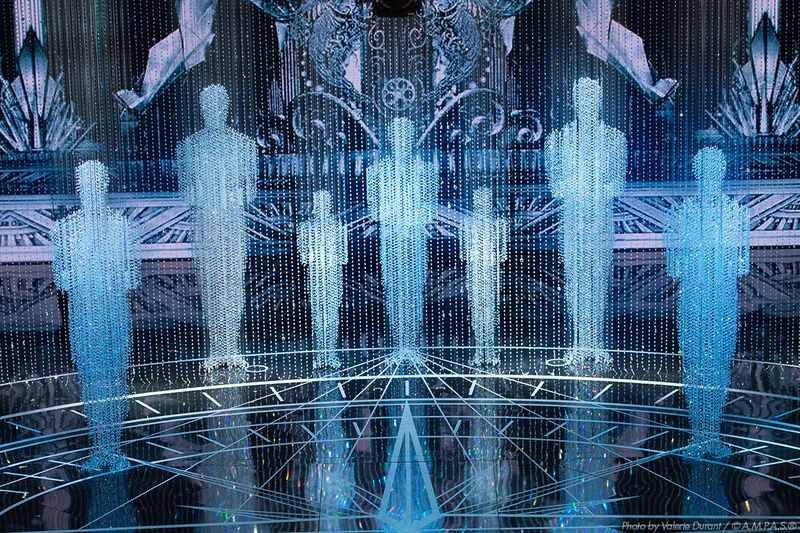 We'll find out on Oscar Sunday, Feb. 26, how the movie musical fares and which movies take home the top prizes. What about the Movie Checklist? 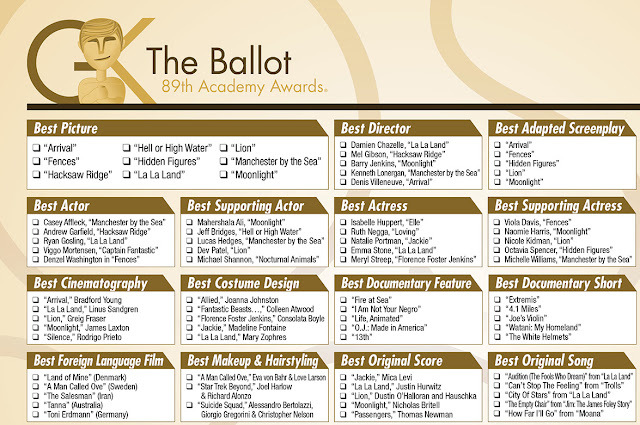 Would also love a movie checklist this year! Thank you :D really great that you make these. Also looking forward to movie checklist, lot of boxes to be checked during next month!